The Mount Vernon estate is a featured location in National Treasure: Book of Secrets, a blockbuster, action-adventure film released by Disney. Director Jon Turteltaub selected the east lawn of Washington's home for one of the most critical scenes in the film. As hundreds of elegantly-attired guests gather to toast the fictional president's birthday at the home of the first president, Ben Gates (as portrayed by Nicholas Cage) decided to crash the party and lure the president into the basement of the Mansion. What ensues is a secret exchange, then utter chaos. Although the scene at Mount Vernon is less than 10 minutes long, the shoot lasted for nearly a week, involving complicated sets, a large cast, a clandestine arrival by boat, and a fireworks display. In addition to Cage, the movie features veteran stars Jon Voight, Harvey Keitel, Ed Harris, Bruce Greenwood, and Helen Mirren. The producer was Jerry Bruckheimer. Nancy Hayward, Mount Vernon's Assistant Director of Education at the time, served as the estate's point person during the project. "It was a very exciting week, and when all the dust finally settled, the cast and crew left everything in tip-top condition," she noted. "I think Mount Vernon will look like a pretty glorious place on the big screen." 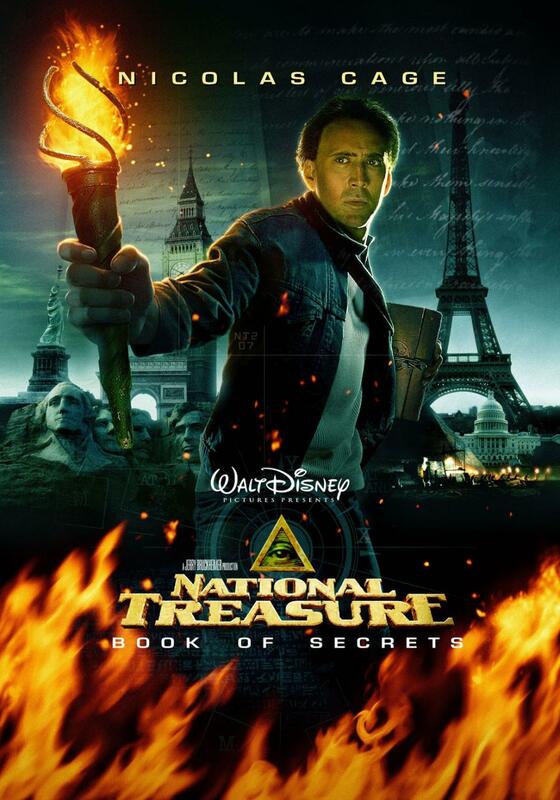 This one-hour walking tour goes behind-the-scenes to areas where "National Treasure 2: Book of Secrets" filming took place. In the movie, the LW corner stone is moved to reveal a hidden doorway. However, in reality, no such secret passage exists! Or does it? Our National Treasure Tour will take you to the cellar, show you the Lawrence Washington cornerstone and see all of the spots used in the filming.